Home» News » XTREME PSP Mag i016 Out Now! XTREME PSP Mag i016 Out Now! Issue 16 of the XTREME PSP Magazine has just been released. 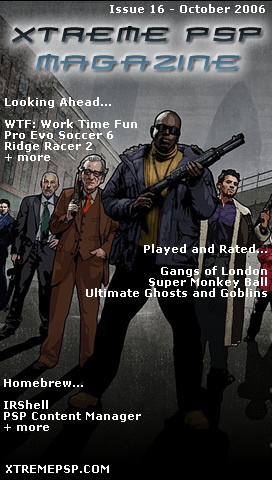 This issue is packed with over 90 pages of great content including previews of Work Time Fun, Pro Evolution Soccer 6 and Ridge Racer 2, plus reviews of Gangs of London, Super Monkey Ball Adventure and more. You will also find all the usual content including news, tips and cheats, wallpapers and a all new homebrew feature. Download a copy now (6.4MB). Cool new issue. Like the new homebrew reviews, but they could be a little longer. Sorry about the length, I did a few reviews and kind of rushed it when I wrote them. I think the next few will be longer, thanks for the feedback.